Mexican, Italian, and More in San Diego! Every tour book on San Diego tells you to go to Old Town to get Mexican food but I don't think any self respecting local eats there without an out of town guest insisting. But amongst the gringo fueled tourist traps are some real gems. How to find the good ones? Easy, just follow me. Little Italy, on the other hand, has so many good restaurants that it's hard to pick the best, especially with so many new new restaurants popping up that are owned and run literally by Top Chefs. Once considered a afterthought, Little Italy has blossomed into one of San Diego's top food (and foodie) destinations. I've also included some of my favorite restaurants nearby, scattered close to the airport and worth the short drive. Locals and tourists line up at Old Town Mexican Cafe for one thing - carnitas, tender chunks of pork that's fried to a crisp wrapped in a homemade corn tortilla. Their Mexican Style Ribs are also excellent, tasting a lot like the carnitas :-) Margaritas are just OK so stick with beer and make sure you ask for the hotter salsa to prove you know what you are doing. If it wasn't for the patio Cafe Coyote would fall into the abyss with hundreds of other average Mexican restaurants in San Diego. But what a patio! It clearly elevates the food to fiesta level and causes even the most jaded local to admit that it's a great place to take their out of town guests to. Homemade tortillas, you can get them "to go" if you are just passing by and want a snack. You're on vacation, you don't have a tan, and you don't care what the locals say, Casa de Reyes looks fun - and it is with the roving mariachis, the colorfully dressed waitresses and the margaritas the size of a fish bowl. I'll give the food 2 stars - it's good, not authentic. But I'll give the experience 5 stars with the fun atmosphere and vacation vibe. Located in the heart of Old Town. DOUBLE DARE YOU, COME ON, CHICKEN?? Most Mexican restaurants have hotter salsa, hot carrots and jalapenos for free if you ask, perfect for a before dinner "dare you to eat that" contest. Just make sure you have a cold margarita handy to put out any flames coming from your mouth. The old Italian guys out front, the smell of dried cod when you step into the Italian market, the line in the back to get into the restaurant, you must be at Filippi's, a throwback restaurant that time hasn't changed. While everyone has gone gourmet, Filippi's has stayed the course, serving up pizza with lots of gooey cheese along with huge portions of lasagne or spaghetti with baseball sized meatballs along with cheap pitchers of beer. Plastic tablecloths, Chianti bottles hanging from the ceiling, and their own free parking lot, a huge bonus in busy Little Italy. It's loud, it's happy, it's vibrant, and it serves up rustic Italian dishes in a bistro-like setting. Tables are close in this tiny eatery but your initial irritation will melt once the food arrives. Start with the creamy burrata served over spinach along with smokey roasted tomatoes and you'll know why this place is always packed. 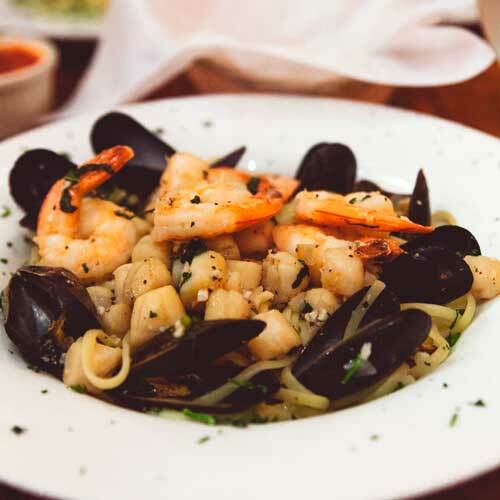 Pasta dishes will transport you to an Italian farm table and the meats and seafood are equally impressive. Noise intolerant people should sit outside but for me the lively scene inside just adds to the experience. OK, yes, Davanti Enoteca is part of a small chain of restaurants based out of Chicago but that doesn't stop it from being one of the best places to eat in Little Italy. Step inside and the setting is rustic yet chic. The enclosed patio in the back is the place to be, complete with a full sized olive tree and twinkling lights. The best way to experience Davanti is to order family style with lots of plates to share, but not too many as the fresh focaccia bread filled with creamy cheese and topped with honey is so addicting that you'll be stuffed before your plates arrive. Pizza just like Mom use to make - not my Mom! I love how San Diego is getting so many chef driven restaurants and how so many of them are making Little Italy their home. Isola Pizza Bar is a delight, a local restaurant that strives to serve up food inspired by the chef's Nonna, not surprisingly named Isola. This means simple food but made with the freshest ingredients. This is good stuff! Chef Massimo Tennino is passionate about recreating the experience of his grandmothers cooking. Start with a plate of antipasti, from cheeses and meats to seafood and vegetables. So good, the quality shines with every bite. But the real stars are the pizzas, cooked in a wood burning oven and served with a nice char. This is the real deal, insanely creative pizzas that should satisfy the biggest foodie in your group. The wine list is equally impressive - try their house wines made by their own winery in Italy. I told you these guys take this seriously! 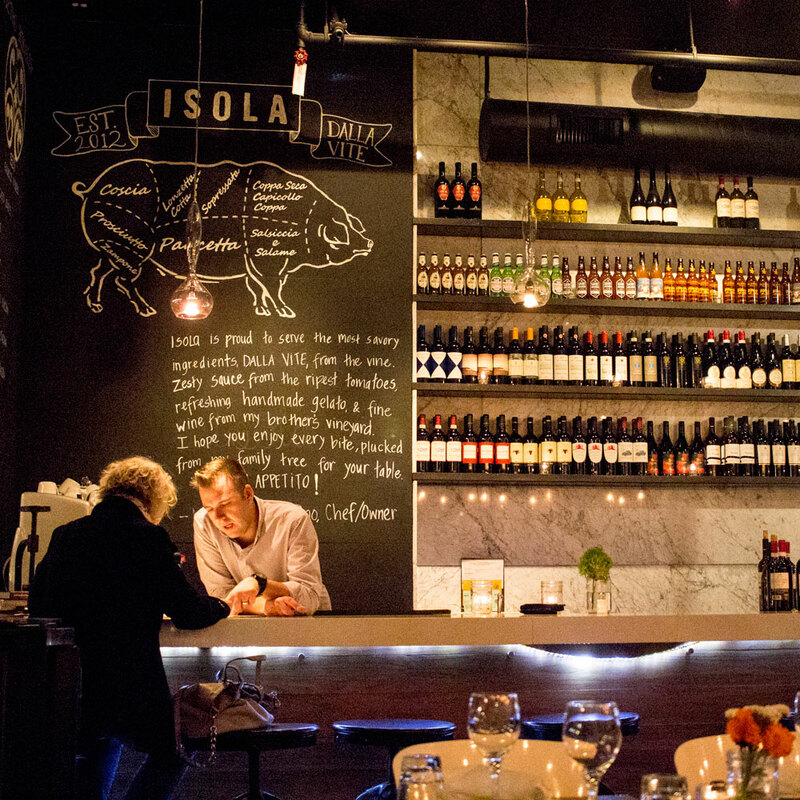 With a friendly neighborhood vibe, Isola is a wonderful breakaway from the cookie cutter corporate restaurants, dining here is like a trip to Italy with Nonna Isola cooking something special just for you. Perfect for locals, a great vacation dinner as well and a top pick in Little Italy. Anyone who has watched Bravo TV's Top Chef will know Richard Blais, the loveable guy who leaned towards crazy molecular gastronomy and ended up winning the show. On the outskirts of Little Italy is his trendy modern restaurant with long lines of foodies waiting to taste his innovative take on American fare, all beautifully plated and ready for their close ups. Make reservations early. In a semi industrial setting is Bencotto, a mash up of a traditional Italian kitchen mixed with a modern urban setting. Think of this as next-gen Italian, a hip approach to the classics that remain true to their roots but kick it up a notch for today's palate. Share plates and make sure you order the house made pasta where you get to pick from a long list of sauces to top. Amidst all of the Italian restaurants is Ironside Fish and Oyster, located in an old converted warehouse that appeals to hipsters and oldsters alike. The funky mid-century interior could be cloying but works and their food is nothing if not outstanding. 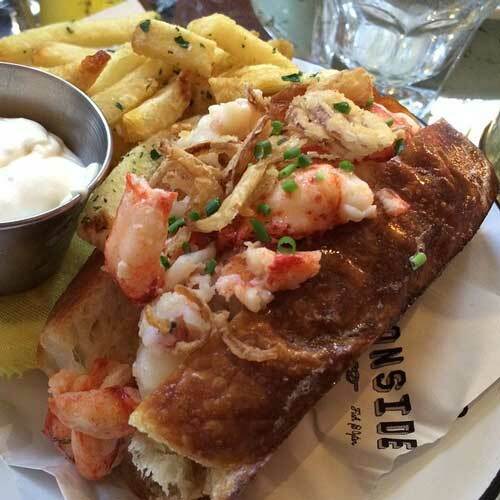 Incredible lobster roll and fish served either fancy with sauces or simple with lemon butter. Outstanding cocktails, one of their specialties. Stay Classy, San Diego. That's the idea anyway behind Lucha Libre, a weird taco shop serving huge burritos and authentic street tacos yet decked out in a Mexican wrestling theme. Start with the TJ hotdog, a bacon wrapped dog topped with grilled vegetables, then move on to a giant Surfin' California Burrito stuffed with carne asada and french fries. Call to reserve the Champion Booth, a flamboyant table with gold trimmings, and be treated like Lucha Libre royalty. It's surely must be ranked right up there with the wheel as most obvious yet innovative invention - the taquito, aka "rolled taco", and El Indio invented it and still makes the best. Add a tamale smothered in chili beans and don't worry whether it's authentic because in San Diego this is how we do it. Dine in the outside "patio" that's wedged inside an intersection for a true local experience. Locals like to stop here on the way to or from the airport for their taco fix and so should you. Only open Thursdays through Sundays, the Wine Vault & Bistro offers multi-course dinners at a fixed price. Menus change often based on what's fresh and available and it's best to trust their wine pairings as these guys know what they are doing. Foodies love the food but your wallet will thank you as well as Thursdays 3 course dinners are $25 and Saturdays 5 course meals are $35. Join a winemakers dinner on Sunday night for the ultimate food and wine pairing experience. I'm guessing the last time this place was remodeled was when Jerry Mathers (as "the Beav") was still on TV. The menu is also a time warp with items like chili burgers, chicken fried steak, patty melts, as well as breakfast. And when you order "liver and onions" you don't get some deconstructed molecular foodie dish, you actually get liver and onions! Toby's is a hidden gem, a place to get great food with a great view in an unpretentious setting. Don't be fooled by their website that makes this place look upscale - while it is neat the ocean it's a dive bar, the sort of place with a bouncer out front. But don't let that stop you because they serve up terrific fish tacos, both fried and grilled, and often get voted as the best in town. Seafood and lots of taco choices, stick with grilled and you can't go wrong. Plenty of local craft beers as well as other seafood options. 21 and above. Serious BBQ fans will gasp at the lack of smokers and the amount of sauce at Phil's but there's no denying that it's delicious. The Sports Arena location is the original and the best and has lines so long that they installed a live camera feed so you can see how long the wait is. I love my BBQ and will admit that Phil's isn't going to compete with Kansas City but when you're in San Diego and looking for great BBQ ribs you've come to the right spot. Two brothers who love to fish own and operate this tiny eatery tucked away next to El Indio Taco Shop, an area that you don't normally associate with seafood. But that's all they do and everything is super fresh with most prepared simply on the grill. You pick your desired fish (ask what's locally caught) and make the big decision of taco, sandwich, plate, or salad. Rivals the expensive seafood restaurants in quality for a fraction of the price. Hodad's has been serving up burgers, fries, rings and shakes since 1969. Now with a location downtown, I like the hippie throwback original in Ocean Beach best. There's not a gourmet burger to be found on the menu, just fresh and juicy meat oozing with flavor and hot and crispy fries on the side. Kids can't out scream the noise and the VW Bus in the middle of the restaurant sets the tone for the magic carpet ride that's Hodad's.